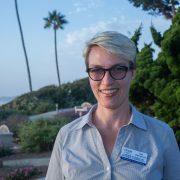 Kat Wentworth is an Occupational Safety Specialist who works with the Directorate and Operations groups at Lawrence Berkeley National Laboratory. Kat serves as Chair of Berkeley Lab’s Safety Culture Work Group and believes that creating a stronger safety culture does not just improve safety; it also can benefit productivity, staff retention, and the overall organizational culture. Kat lead Berkeley Lab’s initiative to improve the Flexible Work Option Policy and Procedure, thus supporting an increased use of the telecommuting option. Kat is an active member of the Lab’s Lambda Alliance and All Access Employee Resource Groups (ERGs).